The western province host Gloucester tomorrow afternoon. AS CONNACHT FACE into a season-defining Challenge Cup quarter-final, Kieran Keane has been boosted by the return of Grand Slam winners Bundee Aki and Kieran Marmion for tomorrow’s visit of Gloucester [KO 1pm]. With their Guinness Pro14 form tailing off in recent weeks, and qualification for next season’s Champions Cup becoming increasingly unlikely via the league route, the Challenge Cup has taken on added significance for the western province. After advancing to the knockout stages as pool winners, Connacht face familiar opposition in the form of David Humphreys’ Gloucester, with Aki and Marmion returning to Keane’s starting XV. The Ireland duo will be joined by fellow internationals Tiernan O’Halloran, Finlay Bealham and Quinn Roux in a strong Connacht side while Ultan Dillane is named among the replacements. The game will be a significant milestone for Jack Carty and Dave Heffernan as both are poised to make their 100th appearances for the province. Aki partners Tom Farrell in the Connacht midfield with wingers Niyi Adeolokun and Matt Healy completing the back three alongside O’Halloran. Meanwhile, former Ulster prop John Afoa will make his 100th appearance for Gloucester in Galway in a side which also sees the return of internationals Ben Morgan and Ross Moriarty to the back row. In total, Humphreys has made six changes from the side which defeated London Irish last weekend, as Welsh international Owen Williams gets the nod at out-half ahead of Billy Burns, who is named amongst the replacements. Email “Aki and Marmion back to boost Connacht for Challenge Cup quarter-final”. 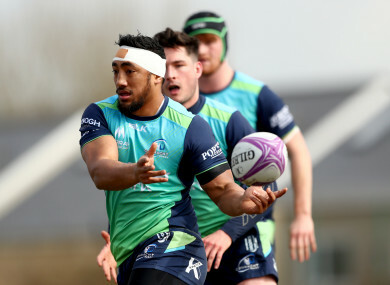 Feedback on “Aki and Marmion back to boost Connacht for Challenge Cup quarter-final”.